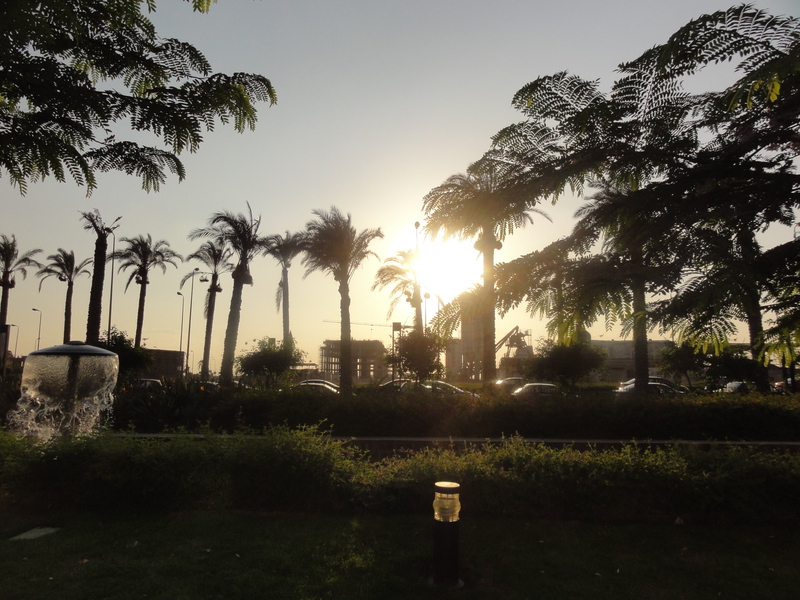 Now that I’ve spent a whopping two full days in Cairo, I feel qualified enough to detail a few of my first impressions of this dusty, palm-tree studded paradise. First of all, dusty is quite the understatement. I remember reading articles and memoirs about people who lived during the Dust Bowl and their descriptions of the dust being everywhere, and I mean everywhere; it became a physical part of them. While dust hasn’t been collecting in our nostrils or anything, it really is in abundance. You track it in on the floors and it lingers on your skin. When the windows are down in the cab, it whips you in the eyes, and you find yourself sneezing quite frequently. I still haven’t overcome the jet lag, though I’ve been trying. Right now, it’s 2:15 in the morning, but my trusty US computer clock keeps reminding me that it’s merely 8 in the States and I’ve got an itching to go out and explore or gorge myself on Mexican food. Sadly, this will not happen tonight. After touring the school yesterday, we went out for dinner and had our first taste of Egyptian cuisine and culture, which is similar to what I experienced in Croatia. 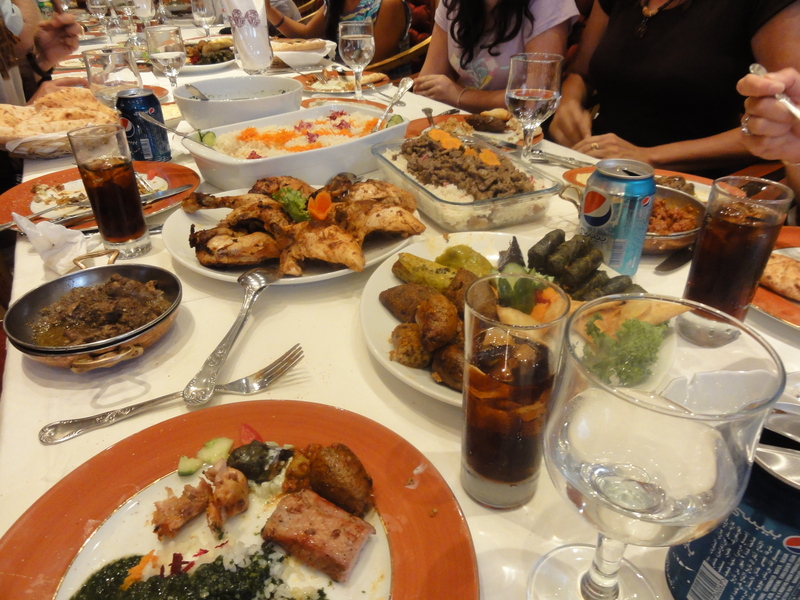 While most people eat to get full, the real point of eating in Egypt is to stuff yourself into a coma. The woman on my right, who quickly shifted from mildly amusing to wildly psychotic, kept taking my plate and offering to serve me, piling more and more various dishes onto my plate. Because meat is specific and does not include multiple varieties. Afterwards, we headed out to a club where we met Ashley’s friend Ahmed who participated in the protests of the Egyptian Revolution. He described it as the best time of his life, and pointed at his neck where he’d been hit with a rubber bullet. He told us how he was hit with tear gas and how impossible it is not to cry, but that he returned home after the second day and came back every day after. Today we spent the day walking around Cairo, which is a very difficult task considering the nearly complete absence of sidewalks. The driving here is comparable to the driving in India: chaotic. Cars snuggle up against each other, three abreast in a single lane, or zip through roundabouts like they’re a final lap in the Indy 500. There are no stop lights, no lane markings (usually), and no speed limits. However, my book about traffic patterns swears that eliminating traffic signs and posted rules altogether results in a much safer driving situation. Why? Because people are more cautious when there’s no direction; when we’re not told what to do, we proceed carefully and are more in tune with our surroundings. Still, this does not make me feel any safer when crossing the street (a task that could, by itself, qualify as an obstacle in the Amazing Race) and you will not catch me with even a finger out the window for fear of a quick and barely noticeable amputation. More in a few days, and pictures to be posted on these entries after we get steady internet. don’t read yet! pictures needed!